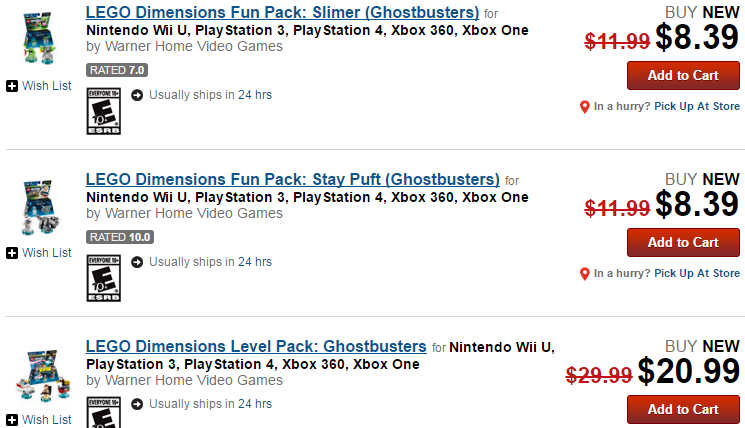 Looking to pick up the three Ghostbusters packs that have been released for LEGO Dimensions? GameStop is offering them on sale right now for 30% off. This doesn’t seem to be an “advertised” sale, so I am not sure when the sale will end. Obviously it’s part of special because of the Ghostbusters movie release today, but I don’t expect the sale to last long. You can pick up the two LEGO Dimensions Ghostbusters Fun Packs for $8.39 each, or the Ghostbusters Level Pack for $20.99. This deal is valid online and in-store. Don’t forget there will be a Ghostbusters Story Pack that will be released this fall!